Prestige Doors is a garage doors specialist in Edmonton, we have completed thousands of installation and repair jobs for our clients. Prestige Doors Commercial garage doors service is top notch, we are reputable contractors that you can depend on to carry out a high class installation or repair. prestige doors has completed installations and repair work on thousands of residential garage doors in Edmonton and the surrounding area, Prestige Doors is renowned for the thorough process that we follow when assisting our clients. It Is Vital That Faults Are Repaired To A Professional Standard Using The Correct Equipment By The #1 Garage Door Company: Prestige Doors. In Edmonton, Garage doors will eventually show signs of wear and tear no matter how well made they are. Sometimes damage will be purely aesthetic, while on other occasions a fault could develop that stops the door functioning as it should. at Prestige Doors we will help you with all your Garage door repair needs. Garage door openers are perhaps one of the most convenient purchases you can make. In addition to making your life easier they can also improve both security and safety at your home. Prestige Doors offers a range of different garage door openers to clients in the Edmonton area. In almost all cases the garage door is the biggest moving object found at the home and can weigh a considerable amount, making it difficult to lift and install without assistance. Prestige Doors in the Edmonton area makes garage door installation easy though thanks to the three step process we have used. Professionally Trained Staff – with Prestige Doors you can rest assured that every member of our team has completed a formal training program and that we are a genuine Authorized Service Provider. Same Day Service – Are you in a hurry to have a new garage door installed? 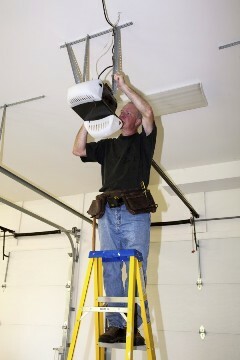 Or perhaps you are experiencing problems with your garage door and need it fixed as soon as possible? If you call us on (780) 665-4666 we can come out to your property and carry out the work on the same day. In almost all cases the garage door is the biggest moving object found at the home and can weigh a considerable amount, making it difficult to lift and install without assistance. Prestige Doors will make your new garage door installation worry free.